Published on 31st October, Changing Britain: HS2 Taking Root shows the imaginative steps being taken by nine cities and towns across the north of England to ensure that they can realise the full benefits of HS2. The cities concerned lie beyond the new HS2 infrastructure but HS2 services will be extended over the existing rail network to reach them. The report spells out the transformed connections in terms of improved journey times to Birmingham and London these places will enjoy. The towns and cities covered in the report are Newcastle, Durham, Darlington and York; Preston, Wigan, Warrington, Liverpool and Stafford. In every case, local businesses and authorities are beginning the process of becoming HS2 ready, planning measures that will bring new development and complementary investment. And with these developments come estimates of further local economic growth and employment opportunities. This is all a reflection of the positive approach HS2 Ltd has taken with local stakeholders – a process that can be seen as having started with the work led by Lord Paul Deighton and published in October 2013. As long ago as 2006, Greengauge 21 pointed out that the experience with TGV network development in France had been that regeneration activity started on the ground around planned high-speed rail stations as long as 7 years before line opening and service introduction. And the French experience also highlighted another key point: those places that recognised and embraced the economic regeneration potential of TGV benefited – while there were other places in France where the benefits were not pursued locally and which were diminished in economic terms as a result. It looks like the message is getting through loud and clear in Britain with HS2. The country needs to be HS2 ready. Welcome though these developments are, HS2 Ltd can – and other key agencies and local authorities should – go further. The places described in the HS2 Taking Root report are all served by trains that will run over a combination of new (HS2) and existing (Network Rail) infrastructure. Four things need to happen over the months ahead to maximise the value this will bring. First, planning these services in the north of England should become the responsibility of Transport for the North as/when it becomes the first statutory ‘sub-national’ transport body in 2017. This is so that the combination of functions that HS2 should play in the north can be fully and efficiently developed, including addressing the need to better connect together the north’s cities, as identified by Sir David Higgins in March 2014. 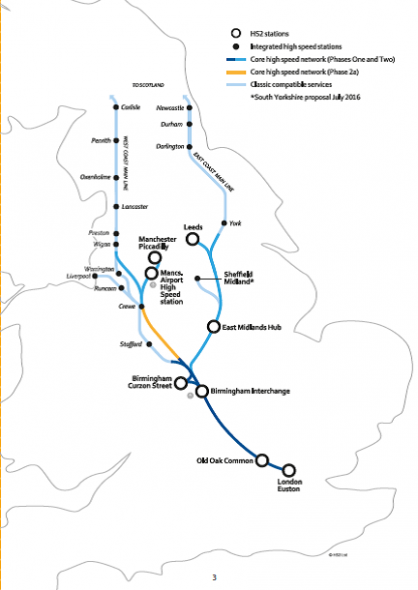 Second, for key northern and midland centres that remain off the HS2 map altogether or get a service on current plans that is in some way compromised, a new and improved train service plan needs to be put forward. To delay this step risks delaying the economic regeneration benefit that we have seen are already starting up in places like Wigan and Darlington. Of the places ignored and left off the HS2 map, the most glaring is perhaps Stoke-on Trent (although there are others). It makes no sense to leave Stoke-on-Trent off the HS2 service plans. Now that it has been confirmed that the connection between HS2 and the West Coast Main Line at Handsacre (just north of Lichfield) is to remain when Phase 2A is built northwards to Crewe, an hourly HS2 service to Stafford from London is planned. But the station call at Stafford would result in a significant journey time extension for whichever of the current set of HS2 services is picked to call there – which might be (for example) the Liverpool – London train (this would reflect the current stopping pattern). This is because the Phase 2A section of HS2, due to open in 2027, cannot be used by trains calling at Stafford. Instead, such trains need to use the West Coast Main Line that exists today between Crewe, Stafford and Handsacre. So this adds about 15 minutes to the through journey, when the time needed for additional station stop is also taken into account. The better approach is to add an hourly London – Stafford – Stoke – Macclesfield – Stockport – Manchester Piccadilly HS2 train, for which there will be very substantial demand (see Greengauge 21 report). Of the places where HS2 plans compromise connectivity, places in north Lancashire and Cumbria certainly need to be addressed. It is here that Lancaster, Oxenholme and Penrith (the two main line stations that serve the Lake District) and Carlisle appear to risk losing the direct trains to London they enjoy today. True, they are offered an HS2 service to Birmingham but are invited to interchange at Preston to reach London by HS2. While quicker than today’s Pendolino timings, being required to change trains will be a disincentive – and for some people seen as a worsening in service offer. There must be a direct hourly HS2 train to London from these stations. Operate the services as northern extensions of the London – Birmingham (Curzon) service. With fast access as planned between the main HS2 line and Curzon station, this will add a relatively modest through journey time extension while providing access between northern centres and Birmingham and removing the need for interchange for through London – North travellers. In this way train paths over the section of route between Birmingham and Carlisle need not be increased (since there is a current plan to operate ‘HS2’ services terminating at Birmingham (Curzon)). Third, the text of the HS2 Ltd report reveals that in practice the different cities and LEPs are at quite different stages of readiness – and indeed have differing levels of expertise and capacity. Some have plans for improved connectivity to HS2 served stations; others do not, yet plans are needed and should be firmed and turned into agreed and deliverable programmes if they are to be truly ready. Fourth, it is surely time a better name than ‘classic compatible’ was found for the trains that will provide the services to locations beyond the new HS2 infrastructure. These trains will quite probably provide the entirety of the HS2 services until 2033 at least, so no doubt the winners of the competition for the recently announced West Coast Partnership – a new franchise that will introduce and initially operate the HS2 services – will come up with something suitable. City authorities and LEPs developing firm plans to ensure that the economic gains from HS2 are not limited to a narrow cluster around stations but spread more deeply across the hinterland. It is not enough to plan HS2’s infrastructure. It is time to get serious as well about service plans, about access arrangements and supporting new spatial developments and industrial strategies across the broad part of the country that HS2 will serve.